The health benefits of nuts have been well-documented, and many people are making a conscious effort to add more nuts to their diets. We are among that number, and usually have a large container of unsalted nuts in the pantry for snacking. 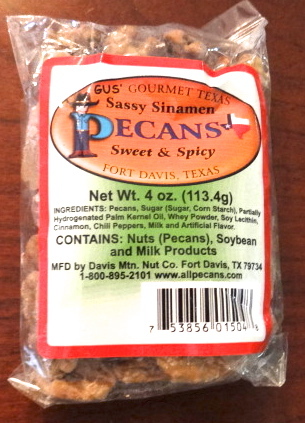 Although The Davis Mountains Nut Company does offer fresh, healthy pecans, we received some of their gourmet candied nuts as a Christmas gift. Delicious? Yes. Healthy? Maybe not as much as our usual unsalted nuts. Since we firmly believe any foods can be enjoyed in moderation, we are happily pacing ourselves through the four flavors we received: Praline, Vanilla Almond, Cinnamon Toast, and Sassy Sinamen. Gus and David Billing started their West Texas gourmet pecan company after wowing friends and family with their vanilla almond pecans. The Billing brothers developed a three-step process in which pecans are first marinated in flavored syrups, then roasted , and finally hand-dipped in sugar-based flavored coatings. That pretty much explains the deliciousness. We opened the brown sugar and molasses coated Praline Pecans first. These pecans had the consistency of crumbly creole pralines you might find in New Orleans, rather than the creamy pralines Karen and her mom make so very well. Still, they were sweet and tasty. Allen thought the Vanilla Almond Pecans were completely amazing. I was a little skeptical about adding almond flavoring to my all-time favorite nut, but this combination really works! Eating the Cinnamon Toast Pecans was like having the cinnamon, brown sugar and pecan streusel topping from a coffee cake without the cake. Yep, they were that good. My favorite flavor was definitely Sassy Sinamen, which has chili pepper added to the Cinnamon Toast Pecans. It starts sweet and ends with a spicy burn. Love it! Gus and David have even more yummy-sounding flavors: Key Lime, Orange Twang, Mocha Madness, Hot-N-Spicy, and Chocolate. They pride themselves on using quality Texas pecans to produce gift-worthy snacks. They operate a small retail store on Main Street in Fort Davis, Texas, about 80 miles north of the Texas-Mexico border, if you happen to be in the neighborhood. They also have an online store where you can shop for gifts, or for yourself! Our gift arrived safely in a sturdy box with a nice handwritten card. The fresh pecans pictured on the company’s website look delicious, and would be great to have on hand for baking. Allen and I snack a lot, but try to snack somewhat responsibly. Lighter meals and in-between snacks suit our lifestyle better than a regular routine of heavy meals. We try to keep a variety of ready-to-eat foods on hand that we enjoy, but are not heavily processed (not counting the peanut butter Oreos Allen currently has stashed in the pantry). OK, we aren’t perfect! 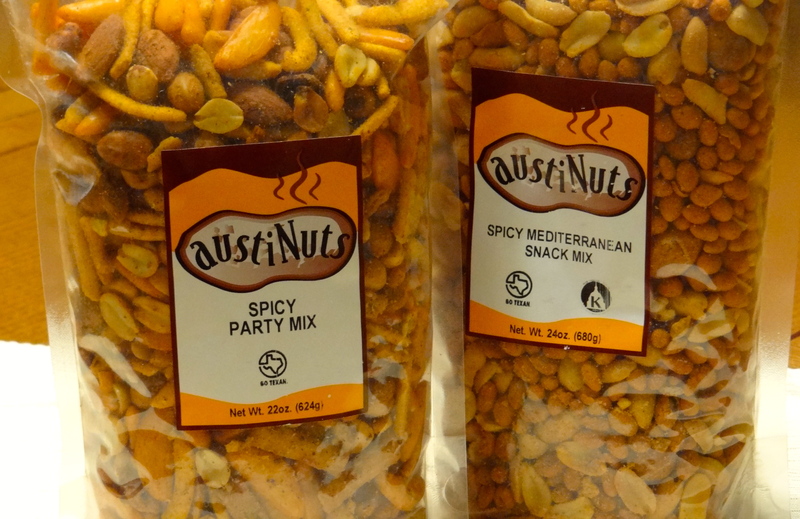 Dry roasted nuts are the specialty of AustiNuts, and because they contain no oil, they are healthier, taste crisper and fresher. Snack mixes with a variety of nuts, crackers and seasonings are also among the company’s most popular products. (Note: the snack mixes do contain oil.) I had seen their nuts and snack mixes before, but had not had an opportunity to try them until now. I tasted several different snack mixes, and selected two to bring home for Allen to try. The Spicy Party Mix lives up to its name with cayenne peanuts, chili lime peanuts, crescent-shaped chili crackers, sesame seeds, jalapeno cheddar sticks, and cajun sesame sticks. It would make perfect game day fare with cold beverages. My favorite is the Spicy Mediterranean Snack Mix. It contains peanuts and sunflower kernels seasoned with sugar and spices. The initial taste on the tongue is sweet, but a pleasant kick of heat follows. If you enjoy sweet and savory combinations as I do, you will be a fan! Doron Ilia and his mother, Cipi, own and operate AustiNuts. 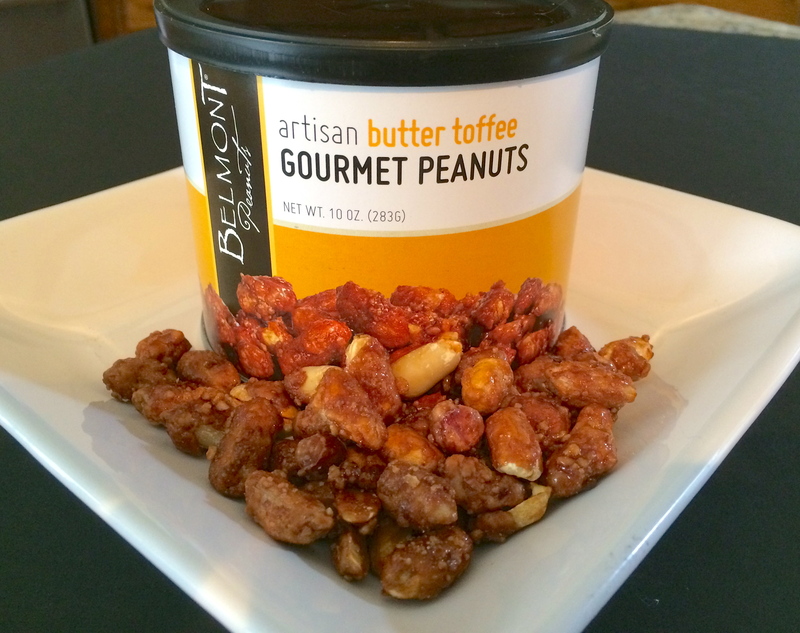 Their website has a an extensive selection of nuts, snack mixes, and other specialty foods. They also maintain a popular retail store in Austin, Texas. Long-time friends and climbing partners Edmond Sanctis and Josh Schroeter were inspired to found their company, Sahale (sah-HA-lee) Snacks, while climbing Washington state’s Mt. Rainier. Perhaps not the most likely place to start a gourmet food business! While their adventure was exhilarating, their trail mix and nuts were dull. You know their dilemma – trail mix sometimes tastes no better than trail dust. Once they returned to their homes, they set about combining premium nuts, dried fruits and exotic spices to create delicious, wholesome and nutritious snack blends. After tasting four of their snacks, we are hooked! Starting at the top of the plate and moving clockwise, the Soledad Almonds contain apple, flax seeds, date, balsamic vinegar and red pepper. The red pepper and vinegar are the first tastes on the tongue, but the sweetness of the apple and date quickly balance the heat. The Southwest Cashews with chili and cheddar are coated with grated cheddar-jack cheese, poblano and guajillo peppers, then slow roasted to a spicy crunch. You can’t get much more southwestern than these delicious seasoned nuts. Barbeque Almonds with mild chipotle and ranch have a classic smoky sweet taste, layered with tangy buttermilk ranch and chipotle pepper heat. Last, but certainly not least, are Valdosta Pecans with sweet cranberries, black pepper and orange zest. While pecans and cranberries might be standard trail mix fare, the pepper and orange zest set this mix well apart from ordinary. It would be very hard to chose a favorite! Edmond and Josh both had careers in entertainment and broadcast fields before establishing Seattle-based Sahale Snacks. Their commitment to environmental responsibility is evidenced by the fact that the company is 100% wind-powered. 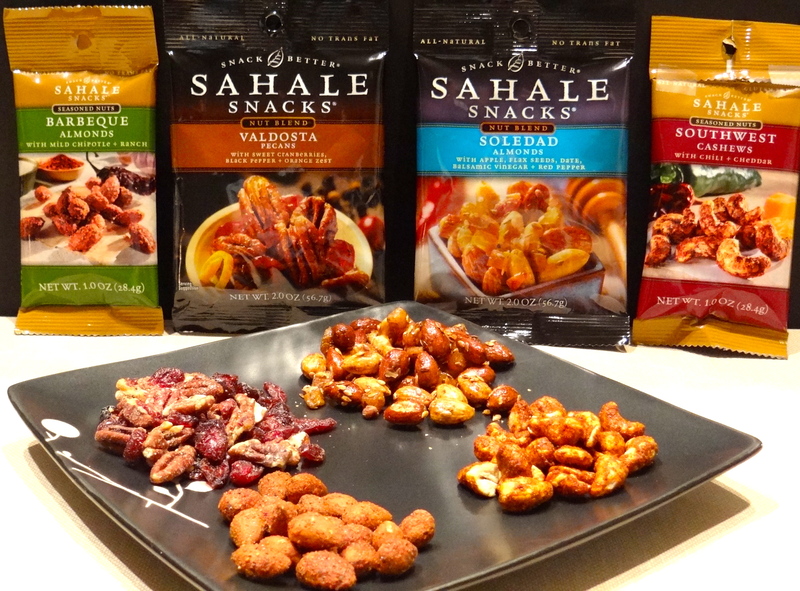 Sahale Snacks has been the #1 best-selling natural trail mix in the USA since 2006, and their products are Certified Kosher and gluten-free. And didn’t we already say delicious? It is safe to say that I’m never going to climb Mt. Rainier; I’m sufficiently challenged by the rolling hills in my neighborhood on my morning run. But aren’t we all a just little more conscious these days of taking better care of ourselves? The trail mix packages ask this question, “Who says indulgent can’t be healthy?” These snacks provide the healthful benefits of nuts, along with oh-so-wonderful taste, in “to-go” packaging great for lunch boxes, backpacks, purses, briefcases, and yes, on the trail. Don’t stop there, though. These treats would be at home on a buffet table, and the company’s website suggests wine and cocktail pairings. With football season kicking off, the snacks would also make great substitutes for high fat and sodium chips. Buy Sahale Snacks directly from the company, or look for them in major retailers, including Whole Foods, Pier 1, REI, Kroger, Hannaford, Publix, and Costco.